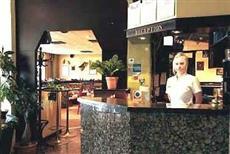 This privately owned Helsinki hotel is located in Malmi, which is on the north side of the city. Thanks to the nearby public transport connections, guests staying in the Avion Hotel Helsinki can easily reach the city center, exhibition center, and the Hartwall Arena ice stadium. Public transportation is available near the Avion Hotel Helsinki. There are 39 air conditioned guestrooms in the Avion Hotel Helsinki, all of which are equipped with a variety of amenities in order to ensure guests are more comfortable during their stay. Travelers looking to grab a bite to eat can head to the Avion Hotel Helsinki’s on-site restaurant, which offers up a variety of international dishes, or can enjoy a drink from the coffee shop. After an exhausting day of exploring Helsinki’s many attractions, guests can head to the hotel bar, where they can kick back and relax with a refreshing drink. A conference room is also available should any business travelers wish to hold a meeting during their stay.